At Pontassieve the old town centre represents all that remains of the Castello di San Michele Arcangelo al Ponte a Sieve. Three gates of the former fortified wall (Florentine, 14 C) are still visible: to the east is the Porta dell'Orologio, to the south is the Porta di Filicaia and to the west the Porta Fiorentina. The Palazzo Sansoni-Trombetta, now the Town Hall, is situated in the centre of the former castle. The Porta dell'Orologio opens onto the original commercial street of Pontassieve, connecting the Castle to the monumental 16 C Medici Bridge over the River Sieve. After leaving Pontassieve and passing along the river Sieve, the road rises to the Villa della Pievecchia with its mediaeval tower. Further along this road is Podere Villa Grignano and on the right is Poggio di Vico, at one time the seat of a castle of the same name. The road rises again to the Monterifrassine Pass. 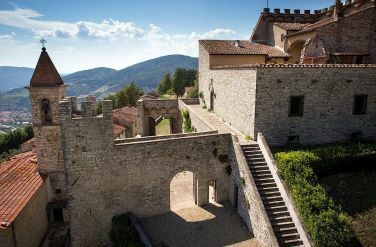 On the ridge, there is a deviation leading to Montefiesole, the location of the Romanesque Pieve di San Lorenzo and, at the top of the hill, the remains of the castle. During the 12 C, this was the feudal seat of the Florentine Archbishop. A short distance before the Pieve there is a crossroads from which a footpath leads to Villa Tassinaia and the peak of Bardellone, where there is a tabernacle. From the Monterifrassine Pass, looking downhill to Sieci, it is possible to discern a downhill path to the small church of Santa Maria a Novoli. The road continues past Podere Villa Bossi to the turnoff to Pontassieve. On the right, on the descent towards Sieci, is Villa Poggio a Remole, a 17 C house constructed by the Albizi family around a mediaeval core. Further downhill to the left, towards Pontassieve, is the road leading to the Chiesa di San Martino and then to the spur where the Castello di Quona once stood (destroyed by the Florentines in 1143). Another interesting route is to follow the road along the River Sieve. The mediaeval della Torre residence is visible above the road past the slopes of Poggio a Vico. 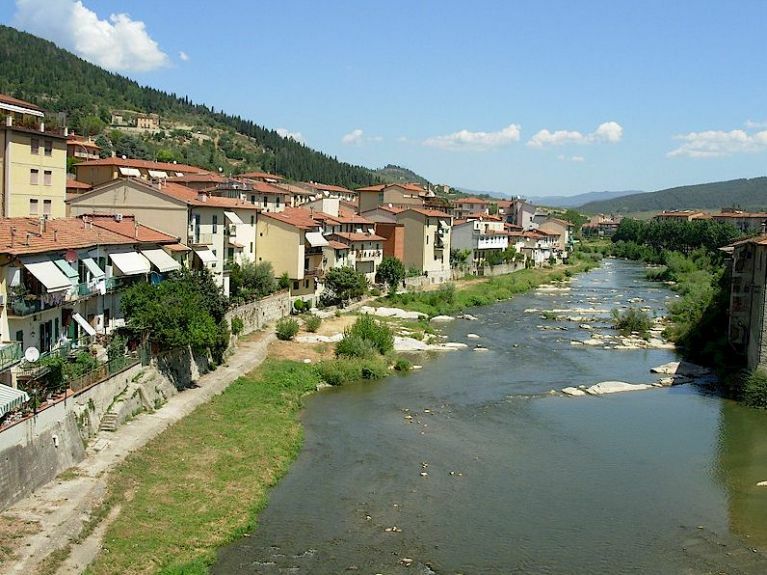 At Mulino di Ponte a Vico, there is a foot route to the remains of a bridge, possibly of Roman origin, which was used until the 15 C. On the road again, there is Podere Casellino and then Montebonello. Uphill towards Acone is the tall Torre di Montebonello (11 C). At Acone, there is a 16 C Pieve. After Acone, the route goes downhill again into the valley of Argomenna and across the road leading to the Villa di Petroio (built by Olivetan monks between the 16 C and 17 C). Further along this road is Santa Maria in Acone and a descent to the bridge of Montebonello. Shortly before the bridge, on the right, there is a deviation to the small churches of San Piero a Sieve and San Martino a Farneto. Returning towards the Podere Casellino farm on the right, it is possible to take the road uphill to Villa di Vetrice (an enlarged mediaeval tower). Monterifrassine lies further along this road, and from there it is possible to reach the tower-houses of Tigliano. From Tigliano to the left is Doccia, and to the right the road climbs to Galiga. The second road to the rightleads Podere La Sturaia and shortly afterwards to Montalto, with the abandoned church of S. Bartolomeo on the left. 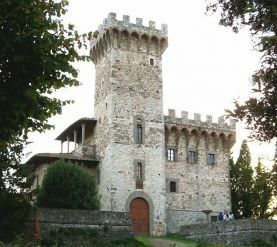 Montalto, one of many castles in Tuscany with this name, has been surrounded by the rural buildings that now occupy the site of the ancient castle. There is the church dedicated to San Lorenzo at Galiga. To visit the most northerly part of the municipality of Pontassieve, follow the highway SS 67, go through Rufina and Scopeti until the road on the left leading to Colognole. Along this road, the Villa di Colognole is on the left, then the church of Sant'Ellero with the Podere Palagio opposite. After the village of Vicoferaldi, the road becomes a dirt track leading to the Pieve di Scopeto. Near the Casa del Tamburino, there is a path that leads to the peak of Monte Giovi and to the Monument to the Resistance, from which there is a steep path to the ancient Chapel of San Giusto. Castello di Torre a Decima: This castle was already in existence in mediaeval times, and features a base which is a parallelepipedon with an array of corbelled arches, and a tower that conforms to the same pattern. The castle also has an elegant courtyard lined with porticos with columns, and an open gallery. Inside, there is a marble bas-relief featuring the Virgin and Child, and underneath the castle there are enormous cellars full of oak wine barrels. 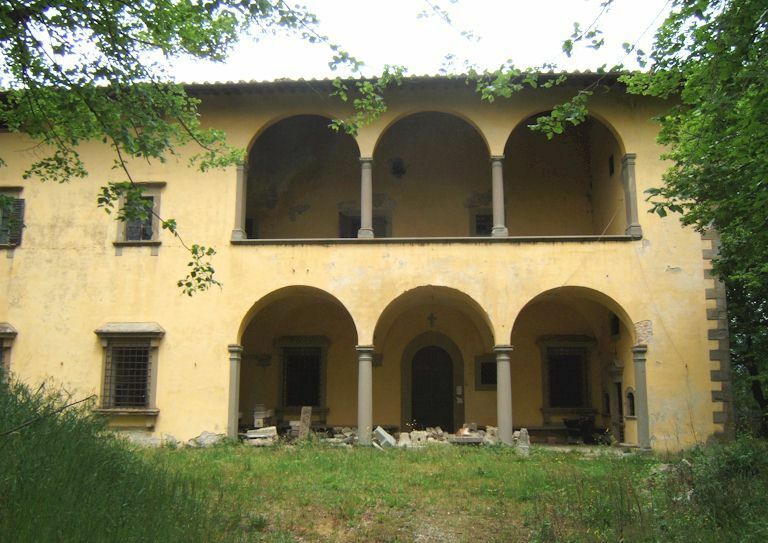 Villa Le Fonti a Pagnolle (Monteloro): A fine example of Renaissance architecture, this villa has a double three-arched open gallery held aloft by columns with cornicing in pietra serena. Inside, there is a great fireplace dating from the 15 C and a 16 C wash basin. Castello di Nipozzano: This castle is located on top of a hill at 350 m, dominating the confluence of the rivers Arno and Sieve. It was one of the most powerful fortifications of the Florentine countryside and still today preserves great part of its medieaval structure. Originally it was dominated by a powerful square-shaped keep witha high tower, built in 1371, and encircled, together with its village, by a double circuit of walls. Unfortunately, the structure was heavily damaged by the Germans during in 1944. The church of S. Niccolò, onto which the tower collapsed tower has been reconstructed.